The most powerful and affordable marketing tools available today is still the full color business card. It is a an easy and impressive way to leave a lasting impression. 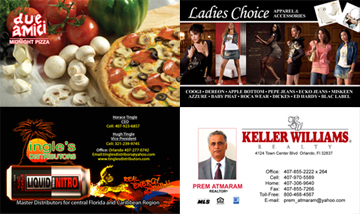 Many businesses get off the ground successfully by handing out full color business cards to potential clients. We offer double-sided full color business cards (we do not charge for the other side) which give you the option to add other information such as, hours-of-operation, mission statement, product images, appointment scheduling…etc. We also offer Inline Foil, Linen, Spot UV, and Silk Laminate special cards which take longer to complete. Printed on cardstock with the option of FREE UV High Gloss Coating. Inline Foil, Silk Laminate and Plastic Business Cards take 5-10 days to complete.